This sharp view from the Thermal Emission Imaging System camera on NASA's Mars Odyssey orbiter is centered on 154 kilometer (96 mile) wide Gale crater, near the martian equator. Within Gale, an impressive layered mountain rises about 5 kilometers (3 miles) above the crater floor. Layers and structures near its base are thought to have been formed in ancient times by water-carried sediments. 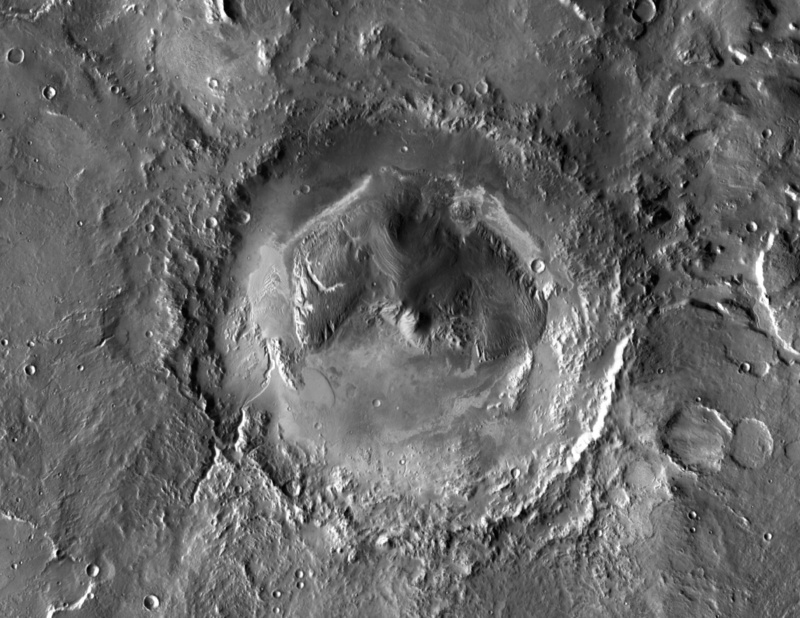 In fact, a spot near the crater's northern side at the foot of the mountainhas now been chosen as the target for the Mars Science Laboratory mission. Scheduled for launch late this year, the mission will land Mars' next visitor from planet Earth in August of 2012, lowering the car-sized Curiosity rover to the martian surface with a hovering, rocket-powered skycrane. Curiosity's science instruments are intended to discover if Gale once had favorable environmental conditions for supporting microbial life and for preserving clues about whether life ever existed on the Red Planet.